Suddenly the D-segment has started to look interesting! Octavia made a comeback with a lot of positive views from the media. Chevrolet launched a facelifted Cruze barely a few days back. Jetta continues with the 2.0L TDI diesel motor which produces maximum power output of 140 horses and peak torque of impressive 320Nm. The other engine is the 1.4L TSI petrol motor which churns out 122 hp of peak power and 200Nm of max torque. Along with a 6-Speed manual transmission, VW is offering the new Jetta with a 6-Speed DSG Automatic gearbox on the 2.0L TDI diesel mill and it is available only in the highline trim. 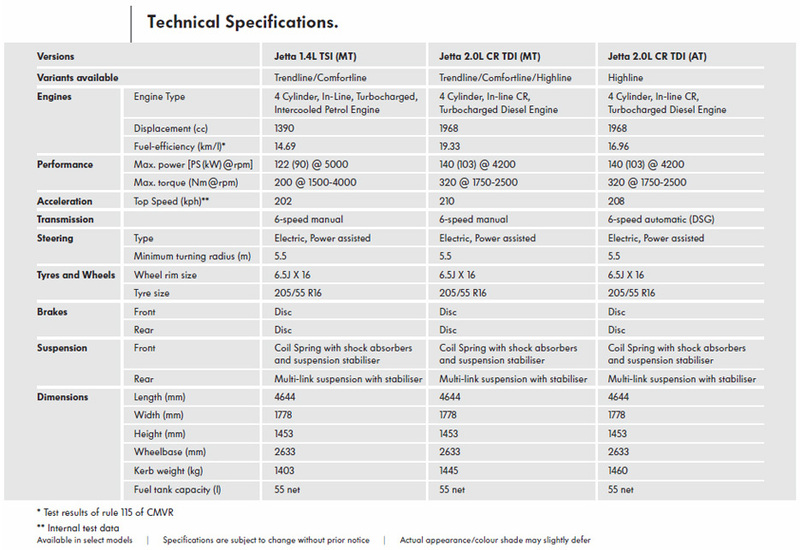 There is NO automatic variant with the 1.4L TSI motor. The 1.4L TSI is not available in the top highline trim and the automatic 2.0L TDI is available only in the highline trim. New Jetta starts from Rs 13.70 Lakhs (which will be for the 1.4 Trendline) and goes all the way upto Rs 19.43 Lakhs (for the 2.0L TDI highline AT) ex-showroom Delhi. VW has not mentioned individual prices for all the trims. Since the brochure is a hefty 8-9MB pdf file; you can click here and open it in your browser.